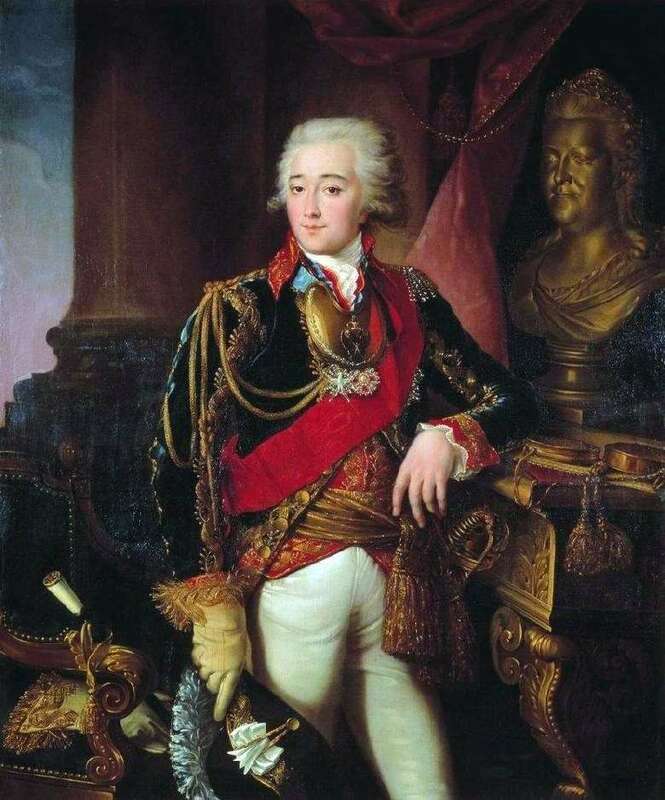 Count Alexander Matveyevich Dmitriev-Mamonov – one of the favorites of Catherine II. Since childhood he was enrolled in the Izmaylovsky Regiment and, patronized by Prince Potemkin, in 1784 he was appointed adjutant to him. Potemkin, taking care that during his long absences near the empress was a man devoted and obedient to him, introduced in 1786 Dmitriev-Mamonov Catherine, whom he very much liked with his beautiful appearance and modesty. In 1786 Dmitriev-Mamonov was promoted directly to the colonels and made an adjutant to the empress; In the same year he was awarded the rank of Major-General and the title of real chamberlain and received a room in the Winter Palace. At first he did not play a prominent role, but in 1787 Catherine took him on a trip to the Crimea, and the favorite had to take part in the Empress’s conversations with various dignitaries and, finally, to attend her meetings with Emperor Joseph II and Polish King Stanislav – Augustus. Since that time, Dmitriev-Mamonov began to take part in state affairs, although very insignificant, since he had neither the mind nor the talents. The Empress, however, in 1788 appointed him his adjutant-general, ensured his property status, asked him for the Count’s dignity of the Roman Empire and, finally, ordered him to attend the council. The position of Dmitriev-Mamonov seemed consolidated; But he suddenly shook him himself, falling in love with the maid of honor, Princess Shcherbatov. The favorites of the favorite hastened to bring this to the attention of the Empress. June 20, 1789 in the “Diary” State Secretary Khrapovitsky recorded the following: “… Before the evening out, Her Majesty herself was pleased to entice Count AMMamonov with Princess Shcherbatova, they kneeling, asked for forgiveness and forgiven.” The bridegroom was granted 2,250 peasant souls and 100,000 rubles and was ordered to leave Petersburg on the day after the wedding. Settled in Moscow, Dmitriev-Mamonov was at first pleased with his fate, but a year later he regrets the lost brilliant position; he decides to remind Catherine of himself, writes her pity letters, asks her to return him his former favor, to allow him to come to Petersburg. The Empress’s answer soon convinced him that his hopes were in vain. Emperor Paul, to whom Dmitriev-Mamonov respected during the “favor”, after his accession to the throne, elevated him to the Count’s dignity of the Russian Empire in 1797, but did not summon him to court. Description and meaning of the painting Portrait of A. M. Dmitriev-Mamonov by Ivan Argunov.